ABAY, Yap — On March 10 – 12, 2017, an FSM Wrestling Team participated in the 2017 Cadet, Junior, and Senior Oceania Wrestling Championship held in Tahiti, French Polynesia. The team consisted of Wrestling Coach Lawrence Uwelur, Yapese athletes Paul Gibay and Thomas Wichilbuch Jr., Chuukese athletes JK Kaminanga and Joshua Aizawa, and NF Official Clark Graham. From the turnout, both Paul Gibay and Thomas Wichilbuch Jr. have earned medals. Paul Gibay, who competed in the 60kg junior category, won a silver medal in the Greco-Roman Style and a bronze medal in the Free Style. Thomas Wichilbuch Jr., who was in the 70kg senior category, brought in a silver medal in the Free Style and a Gold medal in the Greco-Roman style. 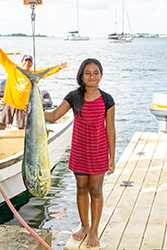 Pohnpei—The Micronesia Conservation Trust, the Conservation Society of Pohnpei, and the Pohnpei Menin Katengensed Fish Market hosted the first ever “My Life My Responsibility” fishing tournament for members of the Pohnpei Fishing Club. 22 boats entered the tournament. 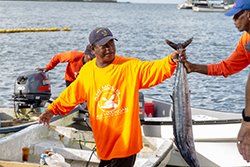 Many wahoos were landed during the day but some anglers were successful with other species as well. The tournament was a big fish tournament. 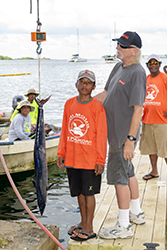 The top five biggest fish received cash prizes with the grand prize being $350. There were also prizes for the three biggest fish in each species if there were more than three of each species caught. There were also three prizes for lady and junior angler. Give a big round of applause to all the anglers who went out. We are also pleased to work in whatever way we can with the conservation groups involved and will wear the t-shirts to support conservation. Everyone have a very Merry Christmas and Happy New Year. We are looking forward to a great 2019 for fishing. Pohnpei—Football (Soccer) coach Chris Smith is from Nottingham, England, the land of the character of medieval folklore, “Robin Hood”, who supposedly stole from the rich and gave to the poor. But Smith is neither an archer nor a swordsman. He doesn’t have a band of “Merry Men” but he does hope to foster a band of soccer players in Pohnpei. He is on his own, using his own money and the money of interested donors in order to continue the work of those who have gone before him to rekindle a love of soccer in Pohnpei, and to help provide a route for the sport to be followed for those who are interested in doing so. He arrived in the wee hours of Monday morning, April 17, not having any clue what time it was or what day it was after having spent three and a half days traveling from the other side of the world. A few hours later, he was at the PICS field, face to face with 25 eager young soccer players. “If there were a bunch of guys with this determination in England, they’d be going places,” he said. “First thing I noticed was, they are not pulling out of tackles. Yeah, the commitment can’t be questioned. I’m scared to play with those guys as someone who is managing an injury.” It was an ACL injury and several surgeries that took him out of game play. After several years of recovery and no injuries, just three weeks before he came to Pohnpei, he injured his knee again. The Federated States of Micronesia will now be sending 11 athletes to Ashgabat, Turkmenistan to compete in the2017 Asian Indoor and Martial Arts Games. The FSM will be competing in Wrestling, Swimming and Athletics (Track and Field). 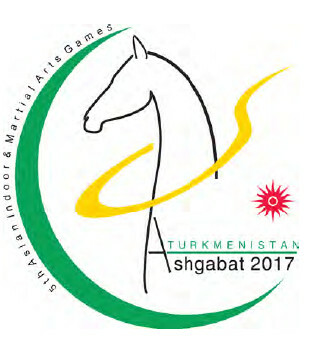 Ashgabat 2017 games are from September 17-27, 2017. The FSM sports delegation, attending the Ashgabat 2017, will include 5 wrestlers (Dukay Tairuwepiy, Richard Nakasone, Thomas Wichlibuch Jr, Myron Damian and Ryan Ifamilik), 4 swimmers (Dionisio Augustine II, Kaleo Kihleng, Jourdyn Adams and Taeyanna Adams) and 2 runners/sprinters (Estanis Ikelap Jr and Alvin Martin). The coaches are Larry Uwelar (Wrestling) Sweeter Daniel (Swimming) and Rendy Germinaro (Athletics). The FSM Chef de Mission is Ted Rutun. Welbert (Donnie) Samuel will be an administrative staff. The FSM delegation will be led by Berney Martin. Jim Tobin, FSMNOC Secretary General will not attend but will be traveling to Yap to assist with the planning and organization of the 2018 Micronesian Games. Over 2,000 athletes from all over the Asia and Oceania regions will participate in 21 sports in the Asian Indoor and Martial Arts Games. The majority of TEAM FSM will depart the Pohnpei on September 11 and arrive in Turkmenistan in September 13. The Opening Ceremony will be held at 7:00pm, September 17. Dionisio Augustine II will be the FSM flag bearer. TEAM FSM will return on October 02. This will be the first Asian Indoor and Martial Arts Games that the FSM has participated in. The FSM National Olympic Committee has been a member of the International Olympic Committee (IOC) since 1998. The IOC had recommended that the small Pacific countries, like the FSM, that participate in the Olympic Games, compete in more regional competitions to try to improve the results of the FSM Olympic athletes. The FSMNOC received funding support from Asia National Olympic Committees, Turkmenistan National Olympic Committee and International Olympic Committee grants for the costs of economy airfares, Ashgabat accommodation, uniforms, insurance and travel stipends for all TEAM FSM members.